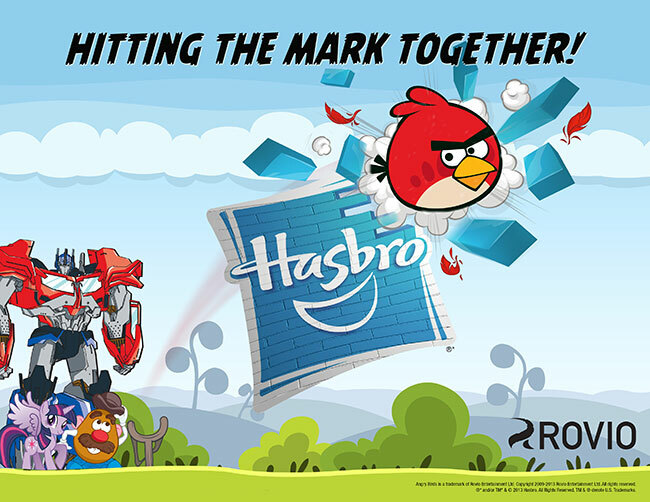 "We are delighted to have Hasbro onboard as a key licensee," said Teemu Suila, COO, Rovio Entertainment. Commenting on the announcement, Naz Cuevas, SVP, Global Consumer Products Licensing said, "We have exciting projects lined up for 2013 and beyond, and Hasbro is the ideal preferred licensee to anchor the program, expand our retail reach and delight our fans." Angry Birds is one of the world's biggest entertainment brands. The original mobile game was launched in 2009 and remains the number one paid app of all time. Angry Birds has expanded rapidly into consumer products, publishing, and animation. In March Rovio released Angry Birds Toons, a weekly animated cartoon series distributed through Angry Birds games, TV broadcasters and on-demand networks. A full-length animated Angry Birds movie opening is also slated on July 1, 2016. "Angry Birds is one of the most recognizable entertainment franchises in the world and we're thrilled Rovio has chosen Hasbro as its premier toy and game licensee," said John Frascotti, Chief Marketing Officer, Hasbro. "With the new Angry Birds Go! property and additional upcoming collaborations between the companies, Hasbro looks forward to delivering more innovative Angry Birds toys and games to kids and families across the globe." The terms of the agreement give Hasbro licensing rights worldwide. New toys and games are planned for fall 2013 based on the upcoming Angry Birds Go! property and Angry Birds Star Wars. More details will be released later in the year. Rovio Entertainment Ltd is an industry-changing entertainment media company headquartered in Finland, and the creator of the globally successful Angry Birds™ characters franchise. Angry Birds, a casual puzzle game, became an international phenomenon within a few months of its release. Angry Birds has expanded rapidly into multifaceted entertainment, publishing, and licensing to become a beloved international brand. Rovio's animated Angry Birds feature film is slated for July 1, 2016.